View Kerby’s full power file. Kerby put in a big effort on this stage getting in the early break. His Normalized Power® was 301 watts for the stage. 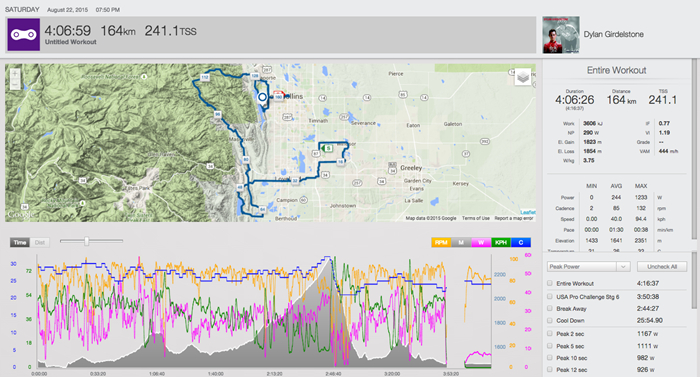 During the roughly 65 miles while in the break, Kerby averaged 24.8mph at 84rpm. After being caught, Kerby recovered and managed a top 20 finish in the bunch sprint putting out his Peak 2, 5, and 10 second efforts hitting 1098 watts at his maximum. View Lozano’s full power file. 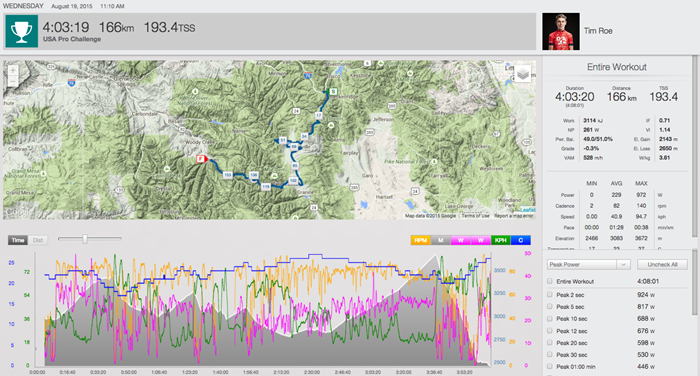 During the climb out of Steamboat Springs on Rabbit Ears Pass, Lozano averaged 254 watts, or 3.91 watts/kg. For the nearly 5 hour stage, Lozano had a Normalized Power® of 210 watts. Lozano burned 2991 calories and average 87rpm on the stage. View Roe’s full power file. Altitude effects a rider’s power by approximately 1% for every 1,000 ft. Starting at just over 9,000 ft. and hitting a maximium altitude of 12,095 ft., during the climb up Indepence Pass, Roe lost approximately 10% of his power due to extreme altitude. Still, Roe averaged 273 watts, or 4.3Watt/kg during the climb. Before staring up Indepence Pass, Roe averaged 205 watts for over two and a half hours and averaged 26mph with a top speed of 56mph while in the breakaway. View Norris’ full power file. 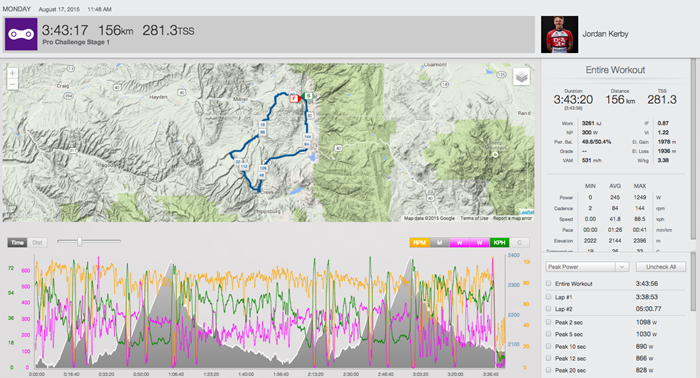 The stage started with a nearly one hour climp up Independence Pass where Norris averaged 297 watts, or 4.35 w/kg. 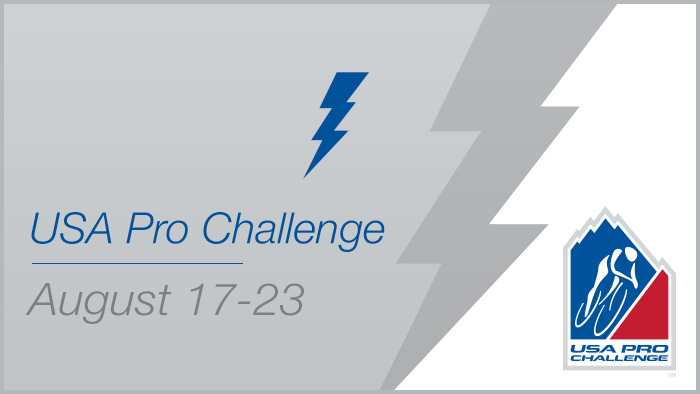 After 5 hours of racing, Norris climbed up Hoosier Pass, averaging 277 watts, or 3.88 w/kg, and an average cadence of 78rpm for almost 18 minutes. Norris made a big effort on the final short climb up Boreas Pass Rd. For just under 6 minutes he averaged 370 watts, or 5.43 w/kg and managed a 12th place on the stage. Norris averaged 331 watts, or 4.85 w/kg. for just under 20 minutes, placing him 8th on the stage. Not surprisingly, Norris’ Peak 5 Minute Power came on the climb up Moonstone Rd. where he average 371 watts, or 5.45w/kg. Norris’ Peak Speed and Cadence were both set on the descent. He reached 51mph at 130rpm. View Girdelstone’s full power file. To get in the breakaway, Girdelstone hit his Peak 10 Second Power of 982 watts. Then just 10 minutes later he had to put out his Peak 2 Second Power of 1167 watts. Girdelstone spent 2:45 riding in the break. Over that time, he averaged 276 watts, or 4.25w/kg. In the final 5:30 of the race, Girdelstone put out 317 watts and averaged 32mph. He hit a peak wattage of 1023 watts and peak speed of 38mph on his way to a 4th place finish. 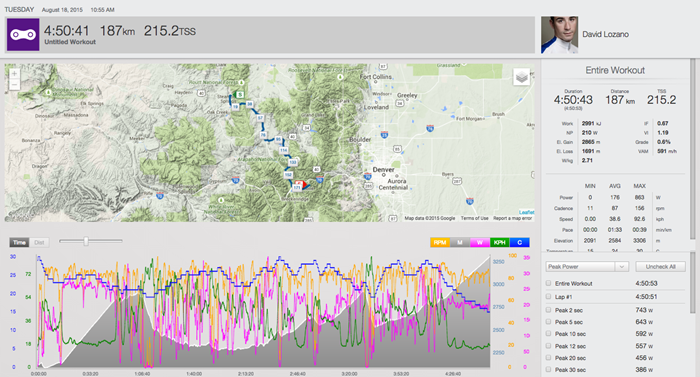 On the 25 minute climb up Lookout Mountain, Kerby average 372 watts, or 5.13w/kg. Not surprisingly, Kerby’s Peak 1 Minute Power 518 watts at a cadence of 98rpm comes at the end of the stage. In the final sprint, Kerby put out his Peak 5 Second Power of 961 watts and hits a max of 1053 watts on his way to a 9th place finish on the stage.